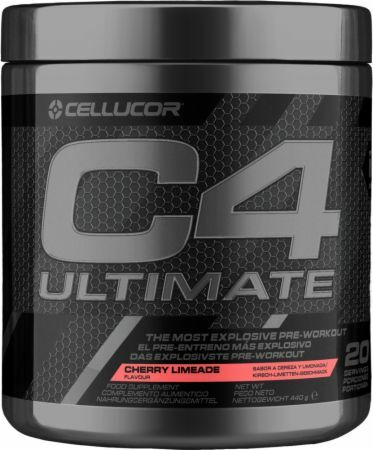 C4 Ultimate - Pulverkonzentrat zum anmischen eines Kaltgetränks. Eine Portion (5,9g) in 200-300 ml Wasser mischen und 20-30 Minuten vor dem Training konsumieren. Achtung: NIEMALS MEHR ALS 2 PORTIONEN INNERHALB VON 24 STUNDEN KONSUMIEREN! L-Citrulline DL-Malate, Carnosyn Beta Alanine, Micronized Creatine Monohydrate, Betaine Anhydrous, Nitrosigine (Inositol-Stabilized Arginine Silicate), Polydextrose, Arginine Alpha-Ketoglutarate, Taurine, Anti-caking Agents (Silicium Dioxide and Tricalcium Phosphate), Flavours, N-Acetyl-L-Tyrosine, Caffein Anhydrous, Trisodium Citrate, Sweeteners (Acesulfam Potassium and Sucralose), Rhodiola extract (Rhodiola rosea), Vitamins (Ascorbic Acid, Folic Acid, Nicotinamide, Pyridoxal-5-Phosphate, Methylcobalamin), Cocoa Extract (Theoboma cacao L.) (standardized for Theobromine), Panax ginseng extract, Colour (Brilliant Blue). Peak Hellburner Hers, 90 Kaps.